Well, I've been here long enough without making too much noice. Now that I am no longer working, I thought I might share some thoughts about what I spend my days (and nights) watching. So I hope you'll bear with an old man's ramblings. The fact that my film watching started in the fifties may sometimes shine through in my preferences. Anyway, here goes. Overview James Bond goes undercover in the treacherous Swiss Alps in this action-packed epic filled with artillery-laden ski pursuits, incredible stunts and nonstop thrills! 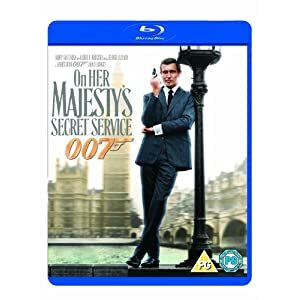 George Lazenby leaps into the role of Agent 007 with supreme confidence and undeniable charisma, even finding love with the beautiful and seductive Tracy Di Vicenzo (Diana Rigg). But first Bond must stop evil genius Blofeld (Telly Savalas) from realising a germ warfare plot that could kill millions! My thoughts When I first saw OHMSS back in 1969, I didn't like it very much. But that may have been because it was the first time Bond was played by another actor. For those of us who had seen all the previous Bond films, Sean Connery was James Bond. Nowadays George Lazenby doesn't seem so bad anymore. In fact, I quite like him. The downbeat ending may have been another reason why many people reacted negatively. However, this is more than made up for by the fantastic photography in the film. The ski sequencies filmed by Willy Bogner are quite amazing. The guy actually skies backwards while filming. Combined with some superb aerial photography this makes for some of the most spectacular ski sequencies ever. The film relies on action and very little on gadgets, which also makes a switch from the preceding Bonds. All in all a very enjoyable Bond film. Overview A volcanic eruption in the North Atlantic brings to the surface a 65-foot prehistoric monster. Two treasure divers capture the creature and take him to London making him the star attraction at the acclaimed Dorkins Circus. A scientist is thoughtful enough to point out that the sailors' bonanza is only an infant, and that a full-grown specimen would be over 200 feet in height. 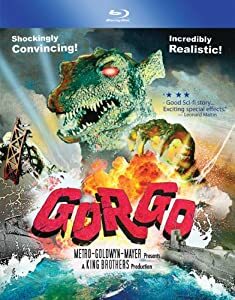 Sure enough, Gorgo's gargantuan mama comes thundering ashore, reclaiming her offspring and heading back to sea — but not before, she trashes a generous portion of London. My thoughts It's not many European made films that have shown European cities devastated by giant monsters. The only other one that comes to mind is the Danish film Reptilicus. While I have a guilty-pleasures-fondness for Reptilicus, I have to admit that it cannot hold a candle to Gorgo. The films is obviously inspired by Godzilla. The miniature destruction of London is as good as anything Godzilla did to Tokyo. Sometimes the filmmakers try a little to hard and add superimposed debris that somewhat detracts from the reality of the scene rather than adds to it, but I can overlook that. The fact that the "monsters" win in the end is also nice. Today this would all have been made using CGI, but there is something special about "real" physical effects and monsters that CGI just can't duplicate. I'm not saying that it's better or worse, just - different. And I like it. The younger generation proably won't like it as much, I guess. I'm still experimenting a little with the format of my reviews. I have written a small utility that does the formatting and I am tinkering a bit with it. I wanted to be able to have half star reviews, so that's what I'll use from now on. 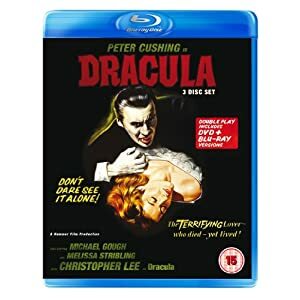 Overview Christopher Lee and Peter Cushing, Britain's premier masters of the macabre, bring the Horror of Dracula to vivid, full-color death in this retelling of Bram Stoker's spellbinding vampire tale. Dracula (Lee), a centuries-old nobleman damned to an eternal half-life, travels from his native Transylvania to London. In the lurid nightlife of his adopted city, he finds new victims. He also finds Dr. Van Helsing (Cushing), a scientist who becomes the Count's implacable foe in a deadly game of bat-and-mouse. My thoughts Hammer's first Dracula outing changed forever how Dracula was portraid in movies. This is Christopher Lee's cinematic breakthrough. Before this he had only played minor parts, and the monster in Curse of Frankenstein, but this was the first time that he really got a chance to shine. And playing against him is the great Peter Cushing. Some have complained that Jimmy Sangster's script leaves out and/or changes too much of Bram Stoker's story. But that's unfair because it's necessary to transform a story when adapting a book. The latest Blu-Ray release of Dracula is a great restoration of an old classic, and includes two short sequences that was thought to be lost, but was found in a damaged Japanese print. A great classic film, and some very good extras makes this a must for serious film collectors. Unfortunately this release seems to be region B only, but I assume it will be released in the US eventually. I don't think I've seen that one..I have a few of the Hammer Dracula movies now. I like the star graphics you are using. Horror of Dracula is a great film. While Christopher Lee's character has not a lot of screen time and also only a limited amount of dialog his role has a great impact here; which is what made him a star from this film. Although, for me, I have always identified him with the Dracula films and have hardly seen him in anything else. If this Blu-ray is region free, I'd order it in an instant. Unfortunately a region A release has not yet been announced. You should get a region free BD player, Achim. Then you don't have to worry. Mine is an Oppo, which was rather expensive, but there are a lot cheaper models available that you can get modded nowadays. The only thing to remember is that they cannot determine region automatically for BDs (only for DVDs), so you have to switch region with the remote. 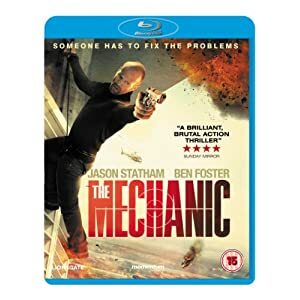 Overview Jason Statham is Arthur Bishop - The Mechanic - an elite assassin with a unique talent for eliminating targets with deadly skill and total emotional detachment. But when the agency double cross him and his mentor and friend Harry (Donald Sutherland) is killed, Bishop enlists Harry's son (Ben Foster) on a mission to avenge his death. As tensions rise and deceptions surface those sent to fix the problem soon become the problem themselves in this explosive, high-octane thrill ride. My thoughts I don't remember much of the original Mechanic (1972) with Charles Bronson. And perhaps that's just as well. If I did maybe I would like this version less. Bronson is a better actor than Statham, but a film like this doesn't need great actors, so it doesn't matter too much. If you're in the mood for some mindless action then this film works fine. If you need something more you may be disappointed. It's a pity that the original isn't available on Blu-Ray. It would be fun to compare them. And in Dracula's case, it would merely be an upgrade anyway, as I own a DVD release already. Overview The remarkable career of the movie industry’s most admired and influential special-effects auteur, the legendary Ray Harryhausen, is the subject of Ray Harryhausen: Special Effects Titan. Leaving no doubt as to Harryhausen’s seminal influence on modern-day special effects, the documentary features enlightening and entertaining interviews with the man himself, Randy Cook, Peter Jackson, Nick Park, Phil Tippet, Terry Gilliam, Dennis Muren, John Landis, Guillermo Del Toro, James Cameron, Steven Spielberg and many more. These filmmakers pay tribute to the father of Stop Motion animation and films such as ‘The Beast From 20,000 Fathoms’, ‘It Came From Beneath The Sea’, ‘The 7th Voyage Of Sinbad’, ‘Mysterious Island’, ‘Jason And The Argonauts’ and ‘The Golden Voyage Of Sinbad’ – the films that enthralled them as children and inspired them to become filmmakers in their own right. My thoughts If you don't know who Ray Harryhausen is, you need to buy this title. If you do know who Ray Harryhausen is you need to buy this title. Ok, maybe that's a bit extreme, but the fact is that Ray Harryhausen is an extraordinary person who has had a HUGE impact on visual effects. If you are the least bit interested in visual effects you should learn about Ray Harryhausen. Today most effects are created with computer imagery, and there are often hundreds of people involved. Ray did it all himself. He was a one man visual effects studio. He was mainly a stop motion animator, and truly a great stop motion animator. His films inspired generations of stop motion animators. Without Ray we may never have seen Wallace and Gromit, Nightmare Before Christmas, Coraline and ParaNorman. But he also inspired lots of other visual effects people. You can hear them tell how Ray's work was the thing that inspired them to go into the business. Ray Harryhausen is one of the very few technicians who has been elevated to a position above the directors of the films they worked on. If you ask people who made The 7th Voyage of Sinbad or Jason and the Argonauts, they'll most likely say Ray Harryhausen, not Nathan Juran or Don Chaffey. Me, I'm a long standing Harryhausen fan. I've got all his films on DVD (and some now on BD), almost all books published about him, and still I learned new stuff from this film. Unfortunately, this title seems to be region locked to region B. Sorry Achim! ;-) It's available from Amazon UK on DVD as well, but the DVD is actually more expensive than the BD. Ray is way more prolific, of course, but I think his mentor/idol was Willis O'Brien...? I own Jason and the Argonauts (Blu-ray) and SHE (DVD). I'd have to check if there are more in my collection. Funny story about SHE: I watched the colorised version, since Ray promoted it in an introduction before the film, but ultimately kept changing back to black and white because it just looked better after all. Should I get his version of Clash of the Titans, or any mother of his movies you may recommend? The effects he did for Earth vs. the Flying Saucers are really great considering it was done in 1956 (to be honest even more than 60 years later the effects are top notch). I haven't watch it in a while but it's a good alien invasion theme B movies. I love all Ray's movies, so it's hard for me to recommend any specific ones. The one that people seem to like best apart from Jason would be The 7th Voyage of Sinbad. But then it's up to your own preferences. First we have Mighty Joe Young (1949), his only collaboration with Willis O'Brien (except for a short sequence in The Animal World). You may have seen the '98 remake (in which Ray had a cameo). King Kong style, but with a friendlier ape and a happy ending. Then we have Ray's monster period with The Beast from 20.000 Fathoms, It Came from Beneath the Sea and 20 Million Miles to Earth. If you're into 50's giant monsters, these are definitely worth seeing. These are all b/w. Jimmy already mentioned Earth vs. the Flying Saucers. No monsters in that one, but nice animation of saucer attacks and saucers crashing into Washington landmarks. The Three Worlds of Gulliver doesn't have a lot of animation, but quite a lot of other effects. Mysterious Island is the Jules Verne story with giant animals thrown in. First Men in the Moon is H. G.Wells done in Harryhausen style. Not a whole lot of animation in this one, but it's a lot of fun anyway. One Million Years B.C. and The Valley of Gwangi are dinosaur movies. Most believable dinosaurs prior to Jurassic Park (with the possible exception of Jim Danforth's animation in When Dinosaurs Ruled the Earth). The finally we have Clash of the Titans. The Medusa sequence is top notch; thrilling and great animation. I didn't like Bubo, the silly mechanical owl. Unnecessary comic relief, if you ask me. The only film where Ray had help animating (by Jim Danforth and Steven Archer). Worth watching, but not his best film. Way better than the remake, though, I say, but I know that some people disagree. Regarding Ray's promoting of colorised movies, I'm as surprised as anybody. Especially when it comes to She, which Ray had nothing to do with. When it comes to his own work, he states that the reason these films were in b/w was entirely economical and not artistic. If they could have afforded to make them in color, they would. Although I don't think he has said it, I suspect that he felt that colorising them would make his movies more accessible, since many young people simply will not watch b/w movies. My personal feeling is that colorisation - no matter how well done - does not add to the value of the movie, but rather the opposite. The same way that you lose something if you watch a movie dubbed rather than in its original language. That said, I think it can be fun to re-watch part of a movie colorised, just to get a feeling of what it might have been like.